What is this infatuation we have with fear? Some people LOVE it!!! Scary movies, haunted houses, popping out of boxes/around corners to terrify friends, gruesome costumes…it’s all around us. Last year I experienced first-hand the phenomenon that is UNIVERSAL STUDIOS HALLOWEEN HORROR NIGHTS during an onsite training. You’ve probably watched the hilarious videos of Ellen’s poor assistants who attend this event every year (and if you haven’t, it’s worth watching.) But before I tell you about MY experience, here’s a little background information. Halloween Horror Nights began in 1991 under the title “Fright Nights” but took on its current name in 1992. It started as a 3-night event at the Universal Orlando Resort with only two haunted houses but has grown into a 34-night event and last year featured nine “scare zones” and two live shows. 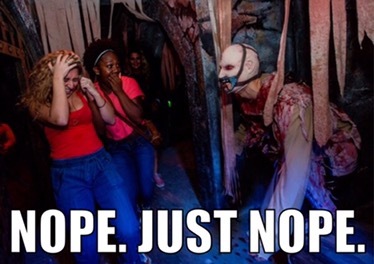 Halloween Horror Nights is now offered in Orlando, Hollywood, and Singapore. Y’all, people love this stuff!! I’m not gonna lie – it’s not for me. I get borderline angry when they show a scary movie preview right before I watch my romantic comedy. It’s not uncommon for theme parks to offer Halloween events but Universal Studios takes it to a whole. new. level. Most parks repeat their events year to year, but Halloween Horror Nights introduces a fresh lineup every fall. Generic monsters? Not Universal Studios! Their scare zones feature brand-name stories and characters with big-budget aesthetics and effects. We were told in our training that each scare zone had a budget of close to a million dollars – that’s how serious they take this event! 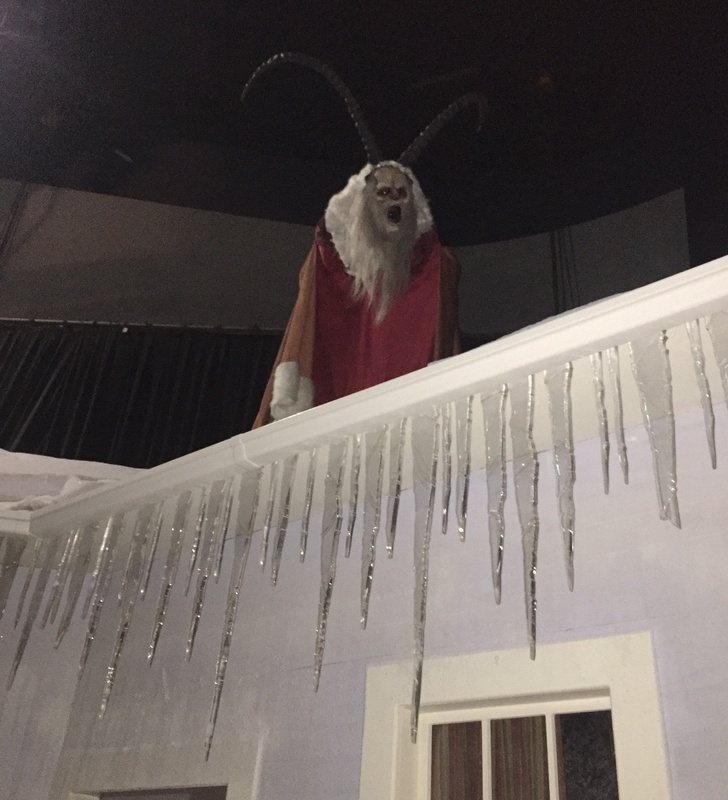 From the disturbing The Exorcist (seen to the left) to the quirky Krampus (seen below), it’s not just any characters lurching at you – it’s the characters you love to hate! Entering its 27th year of Halloween Horror Nights, this Universal Studios event isn’t going anywhere but it is growing in popularity so there’s never a better time to go than this year. On the docket for 2017 is The Shining, American Horror Story, Ash vs Evil Dead and more! Whether you’re planning a trip to explore the Universal Studios parks exclusively or adding this event to an existing fall vacation, take your pick of nights from September 15 – November 4, 2017*. And, if you’re a scaredy cat like me, NO WORRIES – you can enjoy the park during the daylight hours this fall without being uncomfortable. Contact me at grace@atimetotreasuretravel.com or your preferred travel planner to book your Halloween Horror Nights experience now!! *Not for guests under the age of 13. Guests who’ve had one or more children by natural childbirth should prepare accordingly.